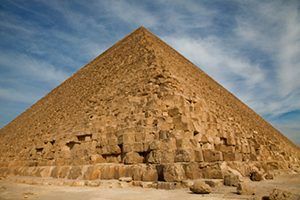 Learn about how Egyptian writing works and what it all represents, plus find out how to spell your name in hieroglyphics – cool! Although hieroglyphics are Egyptian, the word hieroglyphics is Greek. “Hiero” means “holy” and “glyphics” means “marks” or “writings” – so the word means “holy writings“. 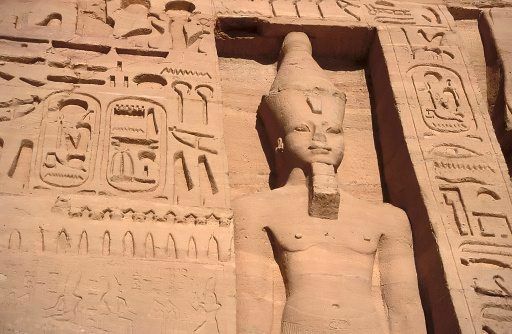 The Egyptians believed there was great power in a name. If someone’s name was remembered then he or she would survive in the afterlife. 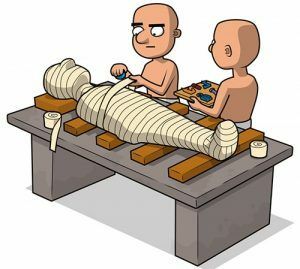 That’s why pharaohs’ names were written in hieroglyphics in their tombs! What do the pictures mean? Most of the pictures can stand for the object they represent, but usually they stand for sounds. In Egyptian, the owl stands for the sound “m”. 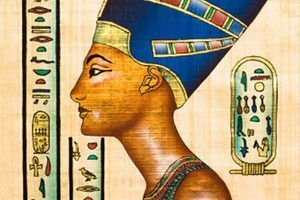 The Egyptian symbol for a mouth can mean mouth but it’s usually read as the sound “r”. 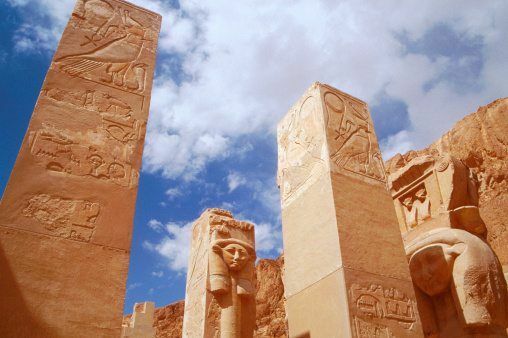 You can’t exactly match our alphabet to hieroglyphics, because they are two very different languages, but historians have come up with a simplified translation of our letters and Egyptian hieroglyphs. 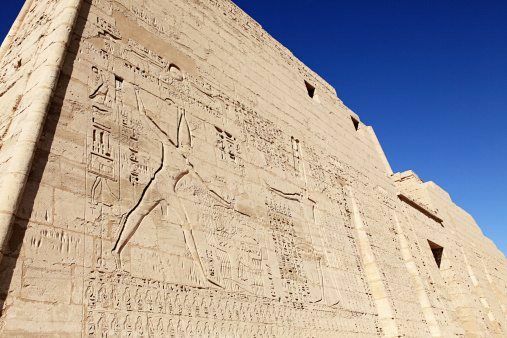 Hieroglyphics can be pictures of living creatures, objects used in daily life or symbols. Some are easy to identify, some confusing and some impossible! If you look at the alphabet chart, you can easily spot the foot, the hand, the lion and the owl, but why are there two different kinds of snakes? Why don’t you use the hieroglyphic chart above to see if you can write your own name? that must of taken a long time to get all of the symbols right. 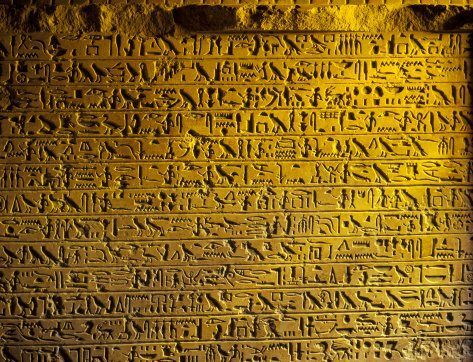 It's amazing that Egyptians made an alphabet with pictures!!!!! This website is a good source of information. Why is e and i the same, wouldnt people have got confused? Btw - they mustve been clever to work it out! I used to have a hieroglyphic set, and it came with the symbol page. I always used it, but the ink ran out and it took too long to get a new one. Shame! I still really like this information page. It is: AWESOME!!!!!!!!!!!!! wow I love animals and history this is awsome!!!!!!!!!!!!!!!!!!!!!!!!!!!!!!!!!!!!!!!!!!!!!!!!!!!!!!!!!!!!!!!!!!!! I love hieroglyphics I did a PowerPoint on hieroglyphics. In year 3 I learnt all about Egypt. The teachers didnt show us the sh and ch ones though. Thanks National Geographic! OMG OMG OMG OMG SO AWESOME!!!!!! WOW! PINK RULEZ! THIS IS AMAZING plus i didnt even this this stuff! doyee this is awesome i didnt know this! thank you very much this has helped me a lot i now know what to do for my history project, my worrying has abated. This site is abs AMAZING! Very cool, I wrote my name in hieroglyphs. I can write some hieroglyphs, but I forget some letters. This page is very helpful. Thanks, National Geographic! Thanks really helped I can confuse everyone now!!!! Thanks so much!This really helped me with my homework! I wrote a ton of stuff with hieroglyphs! Its SO fun! I learned so much about Egypt! this really helps with my Egypt homework! This has helped me IMMENSLY!! !Thank you!!!!!!!!!!!!!!!!!! this website is great i learnt a lot about egypt !!!!!!!!!!!!! this was a great lol! I needed to help my brother with writing them, and this really helped! That was a little helpful thank you for the pictures I didnt like the descriptions. THANKS!!!!!!!!!! so awesome!!! i am gonna write in hieroglyphics with my friends! its gonna be MINDBLOWING when we pass notes and the teacher cant read it!!!! that is so weird all the alphabet isnt there crazy !!!!!!!! radical thanks for informing me more about egypt. 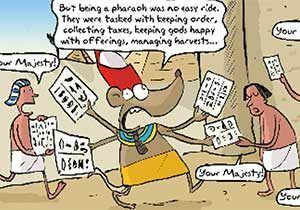 Max in the Land of the Pharaohs!